Remember that part of your life when you could look at some crushed ice and not instantly think of devouring a Margarita? Yep, it’s getting harder and harder for me also! Funnily enough though, there are still some warm fuzzy feelings that come over me when I see an old school snow cone maker or a slush machine that probably indicates my inner child is still in there, bursting to get out and drink a slush puppy. I’m at that age now where purchasing one of these products makes it look like I’m considering the needs of my friend’s kids when we are hosting them at one of our shindigs, when in actual fact it’s a truly selfish buy. It’s the equivalent of buying your kid a drone or a bike for Christmas and then just hogging it all day when they unwrap it citing health and safety issues. There’s often evil laughs running through my mind when I think about how many platitudes I will receive for thinking of the darling little ones and their needs. Considering how brutally simple snow cones are to make, they offer so much pleasure. On those boiling hot days where it’s uncomfortably hot, there is no more effective way of instant gratification than guzzling down a snow cone. Snow cones are made from shaved ice, which are then flavored with a syrup. The shaved ice can be made in a variety of ways including using every-day items such as blenders, and for the desperate among us, rolling pins. The preferred method however, which will guarantee the best ice is to purchase a snow cone machine. These are custom made machines that will make ice which is perfect for your needs. 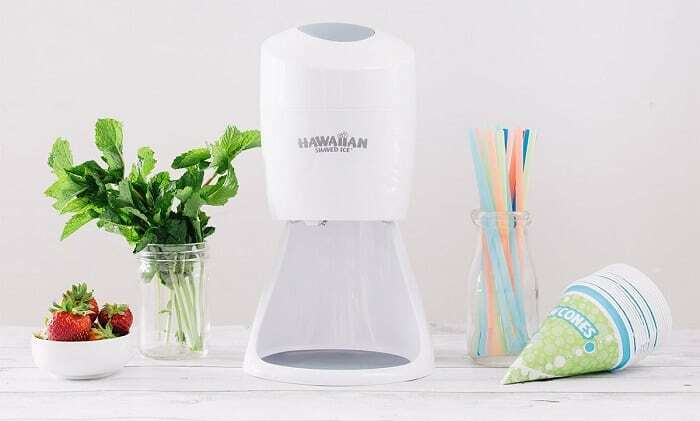 The best-selling snow cone machine on Amazon is the Hawaiian Shaved Ice S900A. It has a great price point and has a couple of nice features thrown into the mix. This is the shaved ice machine I would envisage most people would look to buy as it is great value for money, is extremely easy to use and produces nice fluffy ice for your cones. To aid in the making of this fluffy ice you are provided with two circular ice molds which deliver perfect snow because science. For the more technical among you, or those that like to experiment, it is possible to adjust the blade height which will let you experience varying degrees of coarseness of ice. All in all, this machine is a cheap way of getting some great snow cones although there are some limitations which are reflected in the price such as capacity but for your every-day snow cone needs, this machine is just about perfect. The best mid-range snow cone maker in my opinion is the machine made by Zeny. This has a great industrial look to it which comes at a price which is not too far away from the Hawaiian. It is made from stainless steel and weighs in at 12.3 pounds. 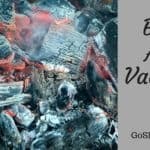 This makes it a very sleek and sturdy option for you if they are the qualities that you are looking for. With this machine you could easily cater to many more people than the previous suggestion which makes it more of a party friendly option. Using this machine is a doddle as you just put your ice in the hole and press down with the handle to let the powerful motor do its job. Cleaning and maintenance is easy due to its stainless steel body. If you find yourself in the middle of Armageddon (more commonly known as a kid’s party) you will want to be rushing out those snow cones posthaste. For this you will need a professional snow cone machine that will make short shrift of the building queue of youngsters. It may cost you more in the short term but if you are playing the long game, this is the option you need to take. The Arctic Blast Snow Cone Machine from Paragon is the daddy of all shaved ice machines, it can shave 500 pounds of ice an hour!! It achieves this by way of its 1725 rpm motor and shaver heads which are made from cast aluminum. It comes with two replacement blades, a powder-coated paint job that is chip resistant and a drip tray that drains excess water that will help extend the lifetime of your snow. Just to reiterate, this is an expensive option but if you’re looking to make multiple cones in as short a time as possible, it is definitely worth it. Slush machines offer us a great way to enjoy frozen drinks and are not, in any way, shape or form, the work of the Devil whose sole intention is to rain down misery upon us through the medium of brain freeze. Slushies have been a part of every child’s rite de passage. Queueing at the local 7-11 for your daily dose of summer iced beverage is a familiar memory for us all and it’s probably the reason we yearn for a dose of nostalgia well into adulthood. Of course, introducing alcohol into our beloved slushy drinks has helped us traverse the path from a sugar filled, innocent beverage into a sugar filled, naughty party concoction but I guess that’s just the way everything pans out!? One thing’s for sure though, providing some slushies at your shindigs where you are catering for a whole bunch of kids (young or old) is a sure-fire way to set yourself apart from the crowd. It’s a guaranteed talking point and a massive crowd pleaser. 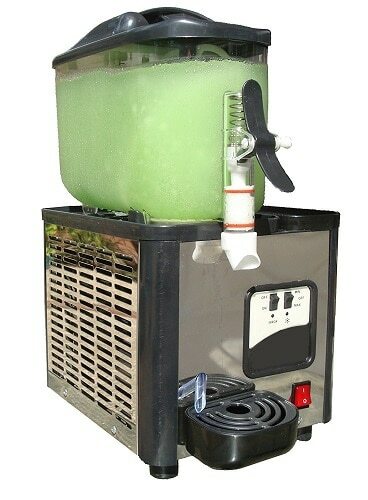 Margarita Girl sell what I consider to be the best slush maker in terms of value for money. Slush makers can get extremely pricey extremely quickly. This machine, although not cheap, does everything that you would expect from higher priced items and delivers consistently good drinks with little fuss. It has the capacity to make up to 25 cups of slushy drinks at one go and comes with an air cooled compressor which delivers freeze-up protection. It measures 12 inches high and weighs in at just under 40 pounds so it’s not light by any means, but this just means that when you find a suitable spot for it at your shindig it is unlikely to be moving anywhere. Make sure you follow the instructions properly and only use mix that has a sugar content of 20%. If you are catering for smaller crowds and you want something a little more discreet or even homely looking then you can’t go far wrong with the Bahamas Frozen Concoction Maker made by Margaritaville. This is a slush machine that resembles more of a blender and in fact comes with a shave and blend function. This is therefore a step up from your every-day blender and given the fact it has a 36-ounce jar, you can start making multiple slush drinks with minimal fuss. It comes with different settings such as blend only or shave only so if you want a bit of variety in your frozen drinks, the BFCM can certainly provide you with it. 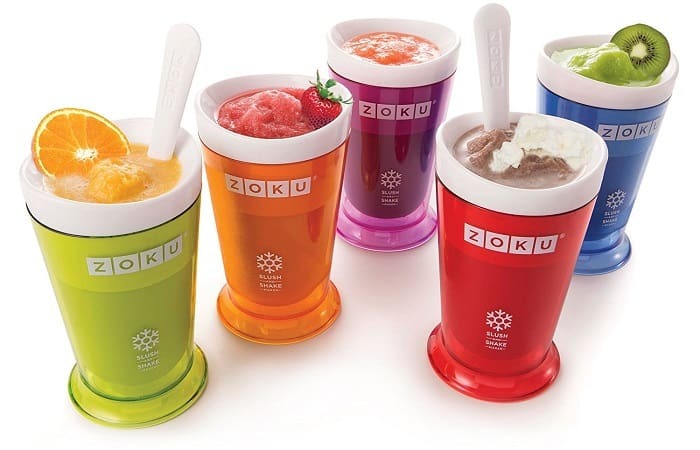 If you are reading this page and thinking, “I really like slushies but never intend to make them for anyone except myself” then you might just be interested in the Slush and Shake Maker made by Zoku. This is an 8-ounce cup to which you add a liquid of your choosing and watch it turn to a slush drink in 7 minutes. It does this by using a frozen inner core which you mix and scrape once you have added your liquid before it freezes before your eyes. It is small enough to easily sit in your freezer which means it is always ready to use and you are never more than 7 minutes away from enjoying a great frozen drink.